An autoimmune disease is a disorder in which the human body treats certain healthy tissues as if they were a threat. Our immune systems are designed to recognize substances according to the antigens they present. Antigens are molecules specific to those substances that our body can “read.” The majority of our bodies know the difference between its own antigens and those that come from elsewhere, such as bacteria and viruses. Some don’t, resulting in an autoimmune disease. There are many different types of autoimmune diseases because our bodies can be triggered to respond this way by various factors. Some examples of such diseases include lupus, rheumatoid arthritis, and type 1 diabetes. Just like there are many types of autoimmune diseases, the symptoms they present can greatly vary. Whatever the variety of disease, inflammation of some sort as well as tissue damage are typically the result. Lupus, for example, generally causes swollen joints and kidney, thyroid, or gastrointestinal problems. Rheumatoid arthritis also causes joint swelling. Diabetes attacks and destroys the cells in our body that would normally produce insulin, resulting in an imbalance of blood sugar. Many of these conditions can result in low-grade fevers as our bodies unnecessarily think they are fighting off an infection. What Causes an Autoimmune Disease? In most cases, autoimmune diseases occur after some sort of triggering event. Sometimes, something may happen to normal cells in the body so that their antigens are no longer recognizable by our bodies. This can happen if a virus, or even a drug, alters cells and they then become targeted by the immune system as if they were foreign intruders. Other times, some drugs or other foreign substances may produce antigens that are similar to healthy tissue’s antigens. After our bodies recognize and begin attacking the foreign matter, they may also attack the tissue that produces similar antigens. The part of our bodies that produces antibodies may become damaged and begin producing faulty antibodies that attack healthy cells. Finally, if certain substances in our body usually stay in one specific organ or body part, but somehow make their way to the rest of our body, our body may become confused and attack the place that substance is coming from. This can occur if an organ is damaged because of a blow, and its fluids make it to other parts of our body. What Are the Similarities and Differences Between Allergies and Autoimmune Disease? 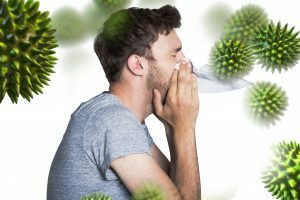 Allergies occur when something foreign is introduced to the body and unnecessarily causes our immune systems to go into overdrive to try to fight it off. Substances that may cause allergies for some may elicit no reaction whatsoever from others. The principal similarity between the two is that the body exaggerates a threat or perceives something as a threat that isn’t, and unnecessarily attacks it. Allergies and autoimmune diseases often present very similar symptoms. Both typically cause some sort of redness or swelling, due to the elevated immune response. Itchiness is another common symptom of both problems. Both can cause a general feeling of fatigue and sickness, in which the sufferer simply does not feel like their usual self. Flare-ups of allergies tend to come on at similar times when autoimmune diseases are at their worse. Thousands of patients who suffer from both report a synchronization of the two conditions. Although they may appear to cause similar reactions to the body, allergies and autoimmune diseases also have many underlying differences. The main difference between the two is the trigger—allergies happen as our bodies respond to an external trigger such as pollen or certain foods, and autoimmune diseases are the result of an internal trigger, our own body’s cells. Another difference lies in how our bodies achieve the excessive immune response. Different lymphocytes are responsible for the reaction we have toward allergens, while certain T or B cells and their malfunction are to blame for reactions associated with autoimmune conditions. Also, treatment for the two differ because we don’t know as much about autoimmune diseases as we do about allergies. Treatments for allergies are now very targeted and specific, while treatment for autoimmune conditions are still quite general. Are the Root Causes of Allergies and Autoimmune Disease the Same? Many individuals who suffer from allergies also suffer from an autoimmune disease, and vice versa. It is no surprise, then, that many patients and healthcare providers have speculated whether the two stem from fundamentally the same problem. Both problems are relatively confined to developed countries and are much less prevalent in developing countries. Some argue for what is called the “hygiene hypothesis,” in which modern countries’ obsession with cleanliness could actually be weakening our immune systems. In this theory, in the absence of dirt, parasites, and other substances that were previously around us all the time, our bodies have become confused. They are used to constantly having to be actively warding off a threat, and when a threat is no longer present, they turn to treating harmless substances and cells as threats instead. The two conditions have clearly different triggers, but as per this theory, could stem from the same main problem. Some evidence can back up this theory, such as the fact that as one condition gets worse, the second usually does, too. The evidence that does exist, however, is largely based on word of mouth from patients, not from empirical scientific data. 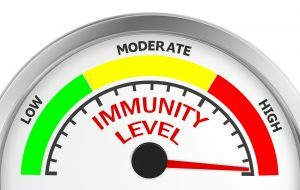 For us to truly understand what the root cause is of the excessive immune system responses to these substances, more research needs to be done that examines how our bodies react on a cellular level. It is most likely just a matter of time until new data is uncovered that reveals the exact correlation of the two ailments. Some refer to the “six degrees of separation” between seasonal allergies and autoimmune diseases, alluding to this inherent connection that can’t quite be proven. Much like the theory’s namesake in which no two people are further than 6 steps related to each other or known to each other some way, the thought is that allergies and autoimmune problems are connected by a variety of factors—time of year, our environment, and family history of either are just some of the factors that affect both conditions. Although still in the early stages, some scientific data has been uncovered that supports the case of the two conditions being related. A gene called the BACH2 gene has been identified that may play an important part in both allergies and autoimmune diseases. Some people are born with slight variations in this gene, which helps to program how our bodies defend themselves. In certain cells, the BACH2 gene determines whether or not they will become regulatory or inflammatory. In a study of mice, it was found that those who had an allergy or autoimmune issues had defective BACH2 genes that therefore negatively affected how their bodies responded to certain substances. Now that this information has been uncovered, scientists can further study the connection between allergies and autoimmune diseases. In order to have buy-in from other researchers and medical professionals, it is important that sufferers of one or both conditions report any correlation between symptoms and time of flare-ups to their doctors. This way, there is a more compelling argument to continue to study the correlation. Once we have a clearer picture of what is going on with the BACH2 gene and any other biological processes that lead to these conditions, scientists can come up with a more targeted solution. As stated earlier the commonality between allergies and autoimmune diseases are the risk to environmental exposures. Often, one will take for granted the amount of time that they truly spend indoors and attribute their illnesses to environmental exposures from outdoors. The truth is that inside your home there are many culprits to negative air quality that if tended to can help remove some of the triggers to your reactions. Removing harmful cleaning products from you home is one of the easiest items to scratch off your list and while you are purging your cleaning items, consider removing scented candles, scented plugins, and machines that emit essential oils and fragrances back into your environment. The next important item on the list should be in treating and removing airborne triggers and VOCs from your indoor environment. An air purifier can certainly help you in mitigating such harmful toxins but that is if you proactively choose the best air purifier for VOCs. The majority of the air purification devices available utilize the same carbon technology which in short works to trap and store the VOCs and chemical odors at the source of the filter. The common problem with carbon is its reputation for releasing back into the environment, the very same chemicals and odors that are has trapped. In addition, homes with, high concentrations of VOCs will fill up the carbon filter a lot faster, which in turn means higher and more frequent replacement costs for the end user. 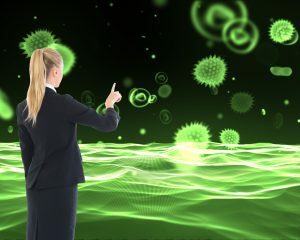 What is the Best Air Purifier for Allergies and Autoimmune Diseases? Naturopath and Environmentalist will all agree that having clean air and removing environmental exposures in your home are some of the more important factors to your road to a healthier life. 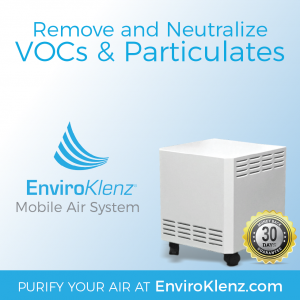 So what makes the EnviorKlenz mobile system the best air purifier for allergies and autoimmune diseases? The EnviroKlenz® technology has proven to be highly efficient “destructive adsorbents” for VOCs making them not only competitively advantageous, but very attractive in multiple for those with autoimmune diseases, environmental illnesses, allergies, and respiratory illnesses. When the EnviroKlenz materials come into contact with harmful odor-causing chemicals, the metal oxides’ active sites first capture the chemical then initiate the neutralization process. • A multi-speed blower offers the quiet and efficient airflow. The low setting allows for near silent operation while still maintaining odor elimination. Medium to High speeds creates maximum air efficiency at noise levels still suitable for residential and commercial use. • No tools are required for unit maintenance. Our bodies are complex organisms that consist of many intricate systems working together just right in order to keep us healthy. When one small component of one of those systems goes wrong, it can affect us in different ways. Sometimes, since these systems are all related, one minor problem can affect various systems of our bodies at once. That is clear from the evidence uncovered so far related to allergic reactions and autoimmune disorders. More work needs to be done to have a clear idea of how the two are connected, but there is already a lot of evidence that they go hand in hand. With more advocates from medical professionals, more testimonies from sufferers, and more research, we will soon be on our way to having a better understanding of just how these conditions are related.